Hi, my name is Chris. 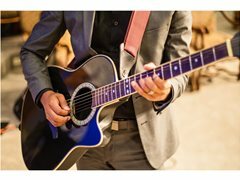 I am a beginner/intermediate singer on the Gold Coast looking to partner up with a Guitarist for small gigs i.e. Bowls Clubs, RSL's, Intimate Venues that are looking for a bit of light/easy listening entertainment. It's a bonus if you can also sing a little so we can harmonise during chorus'. I have a repertoire of 100 songs or so, so we can work with backing tracks if you aren't fully confident playing the entire song solo. I have a very high quality powered EV speaker with great sound and a decent mixer you can plug into. Can meet anytime in January for a rehearsal if we are a good fit. And I'm flexible around my casual work throughout the year. This is a skill I'd like to explore further in addition to my acting. Paid : When we are ready we can split payments 50/50.